A new and exciting series from the creator of the Mole Sisters. Welcome to Parc la Fontaine -- a park in the middle of a bustling city that is home to some surprising characters. Meet Trevor the budgie, who escapes to the park from a nearby apartment, so that he can act wild. But when a tussle with some seagulls leads to ruffled feathers, Trevor decides there's no place like home (at least until next week). And then there's Fiona, the lonely land snail. When Fiona falls for a baby caterpillar, her friend Cohn the silkworm warns that things will end in tears. Sure enough, caterpillar turns to butterfly and flits away. Fortunately it looks like rain, and soon Fiona is back to her slimy self. Finally there's Angela, the little fly who lives her whole life in just one day. And what a day it is! Her high-flying adventures take her on a wild ride around the park. Along the way she evades spider webs, makes new friends, and still finds time to lay hundreds of eggs. Roslyn Schwartz has again created stories that weave simple truths into the lives of charming characters. Her gently kinetic bug's-eye-view illustrations complement the few but well-chosen words of her writing. This three-in-one collection is sure to worm its way into readers' hearts. About Roslyn Schwartz (Author, Illustrator) : Roslyn Schwartz is a published author and an illustrator of children's books and young adult books. 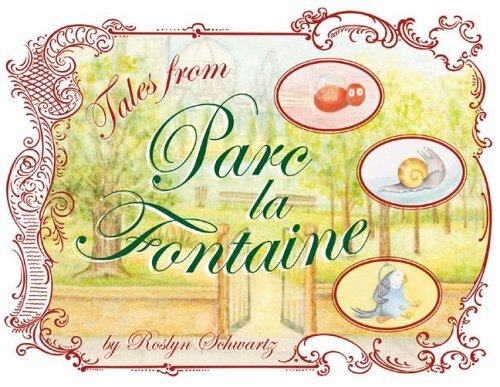 Some of the published credits of Roslyn Schwartz include Tales from Parc La Fontaine, Fairy Tales.